Goldman Sachs and other the Wall Street banks that were responsible for blowing up our economy have now found a new way to fleece us and put our entire economy at risk. Under the not-so-watchful eye of the Federal Reserve Bank, these banks have gotten involved in the production and distribution of physical commodities. The banks' involvement in these commercial commodities enterprises has created new risks these already reckless "too big to fail" banks can't manage. And that doesn't even include the danger of these banks manipulating the price of commodities. Last year, for example, the New York Times exposed a Goldman Sachs scheme that has driven up the price of aluminum -- costing American consumers billions. Yes, billions. The Federal Reserve is finally soliciting public comments period about whether they should close the loophole that allows the banks to produce and distribute commodities. Or use this form if want us to submit your comment electronically. Before Goldman bought Metro International [a company whose warehouses store a quarter of the aluminum on the market] three years ago, warehouse customers used to wait an average of six weeks for their purchases to be located, retrieved by forklift and delivered to factories. But now that Goldman owns the company, the wait has grown more than tenfold -- to more than 16 months, according to industry records. Metro International holds nearly 1.5 million tons of aluminum in its Detroit facilities, but industry rules require that all that metal cannot simply sit in a warehouse forever. At least 3,000 tons of that metal must be moved out each day. But nearly all of the metal that Metro moves is not delivered to customers, according to the interviews. Instead, it is shuttled from one warehouse to another. Because Metro International charges rent each day for the stored metal, the long queues caused by shifting aluminum among its facilities means larger profits for Goldman. And because storage cost is a major component of the "premium" added to the price of all aluminum sold on the spot market, the delays mean higher prices for nearly everyone, even though most of the metal never passes through one of Goldman's warehouses. Aluminum industry analysts say that the lengthy delays at Metro International since Goldman took over are a major reason the premium on all aluminum sold in the spot market has doubled since 2010. The result is an additional cost of about $2 for the 35 pounds of aluminum used to manufacture 1,000 beverage cans, investment analysts say, and about $12 for the 200 pounds of aluminum in the average American-made car. It's not just aluminum. Thanks to lax regulation and oversight Goldman Sachs is now involved in the distribution of uranium yellowcake (the same substance used as a pretext to invade Iraq). And other banks are involved in the production and distribution of electric power and the refinement and distribution of oil, among a whole host of other things. Imagine the economic catastrophe we might face if one of the nation's largest banks involved in oil production were on the hook for the next Deepwater Horizon type of disaster. Even if a bank had the resources to pay the damages, the lack of confidence in the bank by investors and depositors might be enough to cause it to implode and wreak havoc on our economy. As the failure of one large bank could drag down other banks and cascade into a major economic calamity. With respect to Goldman Sachs and the aluminum warehouses, the dangers are less systemic but still deeply troubling. Because Goldman invests in and trades commodities derivatives (financial instruments that are bets on the future price of commodities), the bank's involvement in the storage of aluminum gives it the ability manipulate the aluminum market to the benefit of its overall financial position. As Rolling Stone reporter Matt Taibbi puts it, "It's something akin to letting casino owners who take book on NFL games during the week also coach all the teams on Sundays." We need to make sure the Federal Reserve puts a stop to this. At this stage, the Federal Reserve needs to know the public is engaged and paying attention. We think receiving aluminum cans in the mail will break through the insularity of the Fed and make sure the regulators take notice. Tell the Federal Reserve to get banks out of the physical commodities business. 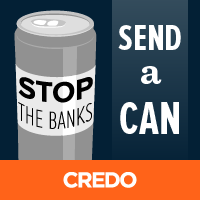 Click here to download a label you can print out, attach to a can and mail to the Federal Reserve Bank.